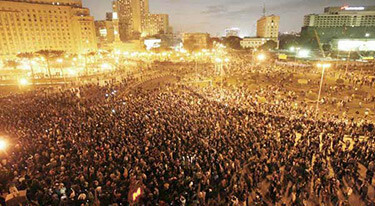 Cairo's Tahrir Square on January 25, 2011. An echo of the Iranian revolution: On reaching power in 1979, Ayatollah Ruhollah Khomeini sought to spread Islamist insurrection to other countries but failed almost everywhere. Three decades had to go by, it appears, before the self-immolation of a vendor in an obscure Tunisia town could light the conflagration that Khomeini aspired to and Iranian authorities still seek. Israel's peculiar situation: Israeli leaders are staying mum and its near-irrelevance underlines Iranian centrality. While Israel has much to fear from Iranian gains, these simultaneously highlight the Jewish state as an island of stability and the West's only reliable ally in the Middle East. Military vs. mosque: Recent events confirm that the same two powers, the armed forces and the Islamists, dominate some 20 Middle Eastern countries: the military deploys raw power and Islamists offer a vision. Exceptions exist – a vibrant Left in Turkey, ethnic factions in Lebanon and Iraq, democracy in Israel, Islamist control in Iran – but this pattern widely holds. A military putsch? Islamists wish to repeat their success in Iran by exploiting popular unrest to take power. Tunisia's experience bears close examination for a pattern that may be repeated elsewhere. The military leadership there apparently concluded that its strongman, Zine El Abidine Ben Ali, had become too high maintenance – especially with his wife's family's flamboyant corruption – to maintain in power, so it ousted him and, for good measure, put out an international arrest warrant for his and his family's arrest. Gen. Omar Suleiman – Egypt's fifth military ruler since 1952? That done, nearly the entire remaining old guard remains in power, with the top military man, Chief of Staff Rachid Ammar, apparently having replaced Ben Ali as the country's powerbroker. The old guard hopes that tweaking the system, granting more civil and political rights, will suffice for it to hold on to power. If this gambit succeeds, the seeming revolution of mid-January will end up as a mere coup d'état. This scenario could be repeated elsewhere, especially in Egypt, where soldiers have dominated the government since 1952 and intend to maintain their power against the Muslim Brethren they have suppressed since 1954. Strongman Hosni Mubarak's appointment of Omar Suleiman terminates the Mubarak family's dynastic pretensions and raises the prospect of Mr. Mubarak's resigning in favor of direct military rule. U.S. policy: The U.S. government has a vital role helping Middle Eastern states transit from tyranny to political participation without Islamists hijacking the process. George W. Bush had the right idea in 2003 in calling for democracy but he ruined this effort by demanding instant results. Barack Obama initially reverted to the failed old policy of making nice with tyrants; now he is myopically siding with the Islamists against Mr. Mubarak. He should emulate Bush but do a better job, understanding that democratization is a decades-long process that requires the inculcation of counter-intuitive ideas about elections, freedom of speech, and the rule of law. Mr. Pipes, director of the Middle East Forum and Taube distinguished visiting fellow at the Hoover Institution, lived in Egypt for three years. 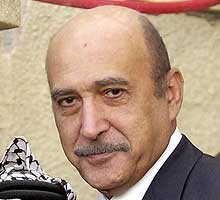 Feb. 15, 2011 update: Omar Suleiman announced Hosni Mubarak 's resignation on Feb. 11 and then disappeared from view. It now looks like Mohamed Hussein Tantawi - field marshal, commander-in-chief of the Egyptian Armed Forces, minister of defense, and chairman of the Supreme Council of the Armed Forces - has filled the role of fifth military ruler of Egypt since 1952. 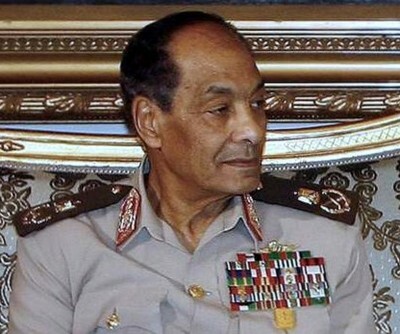 Mohamed Hussein Tantawi, Egypt's fifth straight military ruler since 1952.